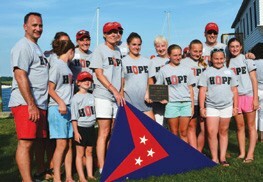 On June 28, the family of Dennis Peterlin hosted The Hope Regatta at the Housatonic Boat Club in Stratford, CT. While Dennis was being treated at Yale-New Haven Hospital for cancer last year, he empathized for patients away from their families while he was able to go home each night to his wife Anne and daughters Megan and Halle. To honor Dennis’ memory, his family organized a regatta and dinner to benefit The Suites at Yale-New Haven Patient and Family Support Fund. Within a couple of blocks of Yale, the suites are hotel rooms where patients and/or their families can stay.